This is Lodovico, a most self-possessed and well-behaved infant. He and I sat across from each other for Christmas lunch at the Savoy and I can only say that in terms of la gourmandise, he left me in the dust. 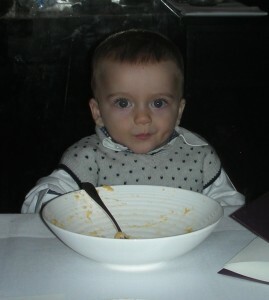 The empty dish before him was his second bowl of polenta. Before that he had enjoyed some of Gordon Ramsay’s “pumpkin soup” (spread across a side-plate to cool by his father, who is a chef and owns a super restaurant in the Abruzzo). Lodovico and I were both guests at a wonderful party for 27 hosted by very dear friends of my mother in a private salon called the D’Oyly Carte room, just on the left of the American Bar. It is an annex of the Savoy Grill downstairs, a restaurant now in G Ramsay’s portfolio, and was the perfect location for the festive gathering. 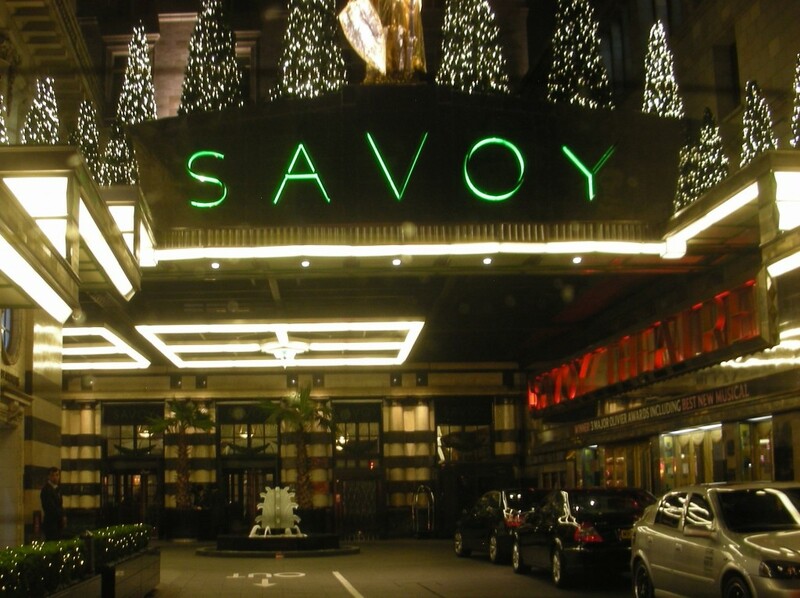 Somehow the kitch art-deco horror vacui of the newly redecorated Savoy has not reached this charming chamber, which was once a most discreet little bar where the theatre producer Michael Codron used to host famous lunches when I was a nipper. I was never privy to those glamorous occasions but my mother remembers them well. I had been looking forward to the Ramsay version of the Christmas feast and much of it was lovely – the turkey itself, to be sure, and the awesome roast potatoes and Brussels sprouts with bacon – and the pigs in blankets (chipolatas wrapped in bacon and roasted) once they had been sent back to the oven to achieve a crisping and a tan. But the great man nodded where the Christmas pudding was concerned – pale, bland mounds, gummy with flour, that tasted as though they had been rustled up that morning, not last year, and came with a sort of brandy butter aïoli that was a very far cry from the echt hard sauce which was always my brother’s speciality. We began with a studied collation of smoked fish – salmon, mackerel and sturgeon with a horseradish mousse, buckwheat blinis and devilled quail’s eggs. My mother can’t eat oysters so she asked the waiter to make sure there were none on the plate. Alas, he misunderstood and set down six perfect Colchester beauties before her instead of the fish. As soon as he was gone we swapped our plates so everyone ended up happy. Very happy, to be sure, for the company and the conversation was stellar and the wines magnificent – Domaine Didier Morion Vent d’Anges 2008 Condrieu with the fish and Hudelot Noellat Chambolle Musigny 2004 with the bird. For me, it was a flying visit to Lunnun Tarn but there were other culinary highlights. The city looked pristine, though it seemed oddly quiet on my late-night perambulations, walking through the echoing labyrinth of Chelsea streets I grew up in, now empty and guarded and somewhat foreign, though marinated in my own nostalgia. England’s economic austerity can be felt. I hope it will prove to be the carfeully controlled deep breath before the glorious plunge into the Olympics this coming summer. Meanwhile my mother roasted pheasants for our first supper (living in Canada, I crave game that has been properly hung in the feather) and then we turned the carcases into a spectacular soup. I found some dressed Essex crabs no bigger than the saucer of an espresso cup and ate far too many of them. There was a very memorable Vacherin at its unctuous Yuletide best – and my mum taught me her recipe for Welsh cakes. Dear friends of my youth, neglected this time around, I shall have you all over for tea when I come back in the spring and we shall see how well I have learned the technique. And then it was Victoria Station at six o’clock in the morning, the hell of Gatwick and Easyjet to Athens and Olympic to Kerkyra… And here I am tonight in room 52 of the Cavalieri hotel in Corfu Town, the esplanade warm and dry under a new moon, the streets bright with Christmas lights and thronged with merry-makers – but more of that anon.